A crucial season. The arrival by Delgado makes the team definitely gamble for the Tour. In order to prepare the Grande Boucle, the team rides the Giro d’Italia for the first time, and the plan makes an effect. The 24th of July, ‘Perico’ enters Paris triumphant as the yellow jersey’s holder. From then on, the Segovian turns into a media phenomenon. A legendary picture: Pedro Delgado climbs through the snow of the Passo Gavia during the 1988 Giro d’Italia. Delgado wears the yellow jersey during the 1988 Tour de France. The 1988 Tour de France winning team. Above, left to right: Lukin, Herminio Díaz Zabala, Gorospe and Omar Hernández. Below: Arnaud, Rodríguez Magro, Delgado and Miguel Indurain. Pedro Delgado before the victory lap in Paris, at the end of the 1988 Tour de France. 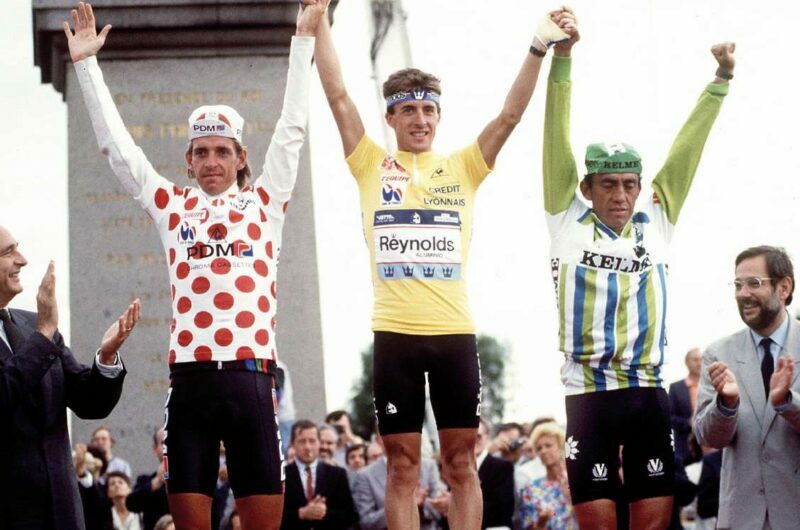 The 1988 Tour de France podium: Rooks (2nd), Pedro Delgado and Fabio Parra (3rd). The team alongside Giovanni Pinarello, president of the bike supplier the team worked with for three decades.